They have so many designs, in fact, that sometimes they don’t remember where the idea for a design came from. 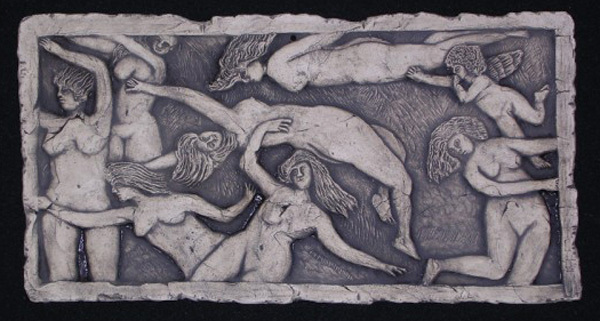 That’s the case with Swimming Women (above): the 121/4-inch-long tile is based on a picture that Bob saw during an excursion to a library or book store or garage sale. 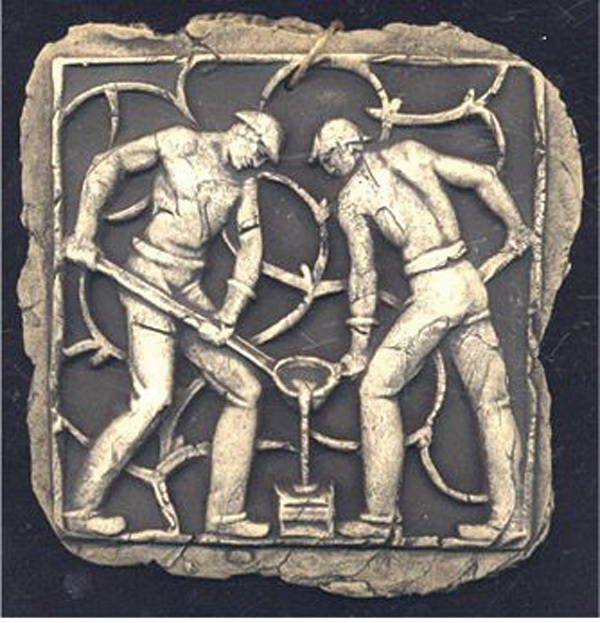 Working Men (left), which features two workmen pouring metal, is based on a WPA design. No matter where the ideas come from, the tiles are lovingly handcrafted by Bob, 64, who carves the designs in negative and presses porcelain clay into the molds, and Iris, 61, who glazes and hand-colors the tiles. Both avid gardeners (together, they started the Bellevue Botanical Garden), they began dabbling in ceramics 18 years ago by making plant pots for their own garden. They still make planters in addition to the tiles, and often do custom designs of both items for clients. After 18 years, the Jewetts still get a kick out of the kiln. “You never get over the excitement of opening that kiln, because every time, something comes out a little different,” says Iris. “Especially the hand-colored tiles: they’re just so beautiful.” Swimming Women costs $52; Working Men costs $26. Contact ceramic artists Iris and Bob Jewett through their company, Wilburton Pottery, at 425-455-9203 or visit wilburtonpottery.com. You can also see their work at the Lake Oswego Festival of the Arts (lakewood-center.org) in Lake Oswego, Ore., from June 23 to 25.